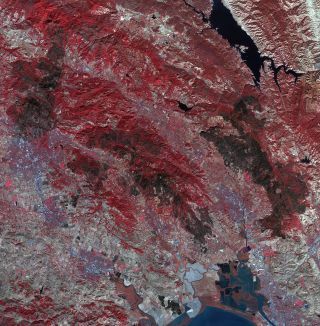 Scars from the fires in California’s wine country are visible as dark patches in this Oct. 21, 2017, image taken by the Advanced Spaceborne Thermal Emission and Reflection Radiometer (ASTER) instrument on NASA's Terra satellite. The damage inflicted by California's wildfires is visible from space. A new photo taken by NASA's Terra satellite on Saturday (Oct. 21) shows big patches of scorched earth in Napa Valley, the heart of California's wine country. In the image, captured by Terra's Advanced Spaceborne Thermal Emission and Reflection Radiometer (ASTER) instrument, live vegetation is red, whereas burned areas are dark gray, NASA officials said. The image covers an area of 38 miles by 39 miles (61 by 63 kilometers). The large body of water at right is Lake Berryessa, which lies east of the Napa cities of St. Helena and Calistoga. The wildfires began Oct. 8 and spread quickly, tearing through much of Napa, Sonoma and Mendocino counties. Hot, dry conditions, strong winds and rugged terrain have made it tough for firefighters to get the blazes under control, but many of the most serious ones are now at least 90 percent contained, according to CNBC. To date, the fires have claimed 42 lives, destroyed 8,400 structures and burned a total of 245,000 acres (99,150 hectares), CNBC added. The cause of the blazes is still under investigation. ASTER is one of five science instruments aboard the Terra spacecraft, which launched in December 1999 to study a variety of Earth's systems in detail. ASTER collects data in wavelengths from the visible to the thermal infrared and features a spatial resolution of 50 to 300 feet (15 to 90 meters). "The broad spectral coverage and high spectral resolution of ASTER provides scientists in numerous disciplines with critical information for surface mapping and monitoring of dynamic conditions and temporal change," NASA officials wrote in a description of the photo, which was released today (Oct. 24). "Example applications are: monitoring glacial advances and retreats; monitoring potentially active volcanoes; identifying crop stress; determining cloud morphology and physical properties; wetlands evaluation; thermal pollution monitoring; coral reef degradation; surface temperature mapping of soils and geology; and measuring surface heat balance," they added. Scientists have also been tracking the California fires using another instrument on Terra, the Moderate Resolution Imaging Spectroradiometer (MODIS). MODIS flies aboard Terra's sister satellite, Aqua, as well.